Wow, this looks fantastical! I've always been a huge fan of the fantasy movie genre, and director Sam Raimi, with his stunning visuals, seems perfect for this project. 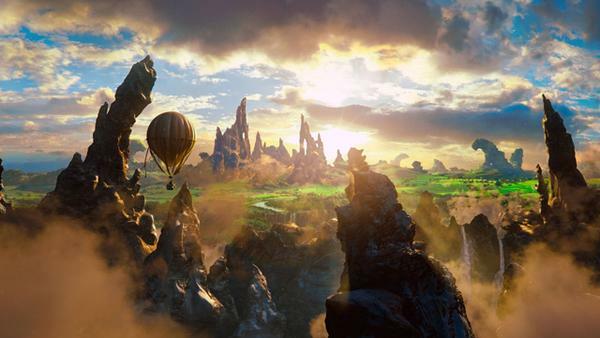 Check out Disney's first trailer for Oz: The Great and Powerful. Take an adventure back to Oz, before The Wizard of Oz occurs. James Franco stars as a young magician who gets whisked away to the magical world upon which he meets the three witches - Theodora (Mila Kunis), Evanora (Rachel Weisz) and Glinda (Michelle Williams). I'm definitely excited for this one. Enjoy! When small-time magician Oscar Diggs (Franco) pulls one too many tricks, he finds himself hurled into the fantastical Land of Oz where he must somehow transform himself into the great and powerful Wizard, and just maybe into a better man as well. Disney's fantastical adventure is directed by Sam Raimi (Evil Dead, Dark Man, Spider-Man, Drag Me to Hell). The screenplay is written by David Lindsay-Abaire and Mitchell Kapner. Return to Oz on March 8th, 2013.
oh wow, sam raimi and james franco doing an oz movie. I'm in. looks like fun. on a side note: thanks kristen for introducing me to Flash Gordon. I would of been lost in the movie Ted with the heavy flash gordon references. Happy Birthday to ME!!! That movie looks AWESOME; what at amazing cast!